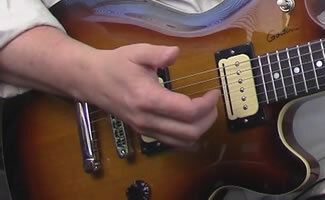 In this video guitar lesson I’m going to show you a slap bass groove applied to the guitar. So a slap guitar groove. This slap guitar groove was actually adapted from one of the grooves in my “Slap Bass Funky Fundamentals” course that can be found on the sister site to Cyberfret.com called CyberfretBass.com. Slap Bass Funky Fundamentals – How to play fun great sounding slap bass lines following a step-by-step system. In the slap guitar groove tablature below any note without any thing indicated above are slapped. Any notes with “P” above are popped. The multiple x’s indicated a left hand hit ghost note. And the single x is a slapped single ghost note. See lower on this page and in the video guitar lesson for more info on these guitar techniques. 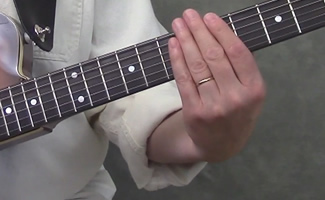 Download an MP3 Jam Track to play with this slap guitar groove lower on the page in the “Guitar Lesson Downloads” area. While slapping sounds cool on the guitar, we are really stealing slap bass techniques and playing them on the guitar. The idea of the slap is that you’re going to “hit” the string with your right hand thumb. The 6th string is by far the easiest to slap on the guitar. This slap is done partly from pivoting your forearm from your elbow, and part from a little flick of your wrist. Try to strike the string with the knuckle of the first joint of your thumb. When you do strike the string, also think about your thumb kind of bouncing off of the string after playing. You want to think of this like a flicking motion from the wrist, not arm. It’s a relaxed wrist motion. You want to get in and get out. There is a quick snap against the string and a quick release. You don’t want your thumb to stay on the string after striking it. Also make sure that you’re not “plucking” the string with your thumb movement. The string is sounded by the force of your thumb hitting the string only. So it needs to come straight down on the string with no sideways movement. The yang of the ying of slap style playing is what is called the pop. 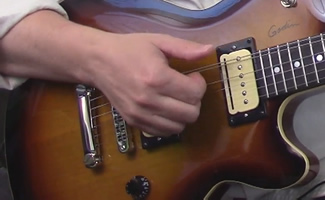 The “pop” sound is created by using your right hand index finger to pull a string out away from the fretboard, and then let it snap back down against the fretboard. You want to keep your right hand first finger curved and just hook it underneath the string you are going to “snap”. Be sure not to pull your hand too far away from the strings after playing, and make as little motion as possible to get the sound. Be sure and keep your wrist relaxed. Often when playing in a funk slap style you are going to have percussive sounds that have no pitch. These are sometimes referred to as ghost notes. . 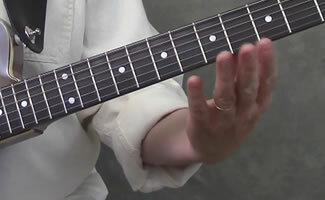 In tablature these are indicated as an x. you are going to slap the string at the same time you are touching it with your left hand to hear just a percussive “thud”. 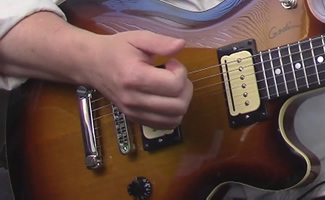 With the Left Hand Hit Ghost Note, you are going to flatten out your left hand 2nd and 3rd fingers and smack the strings against the fretboard. You want to be very careful not to press down and sound any notes. You just want to hear a percussive sound with no pitch. How I’m going to be notating this left hand percussive hit sound is with 4 X’s stacked on top of each other, and a “LH” above. 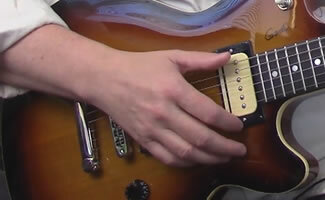 Below you can download an MP3 jam track as well as the guitar tablature for this lesson. If you had fun playing this slap guitar groove, check out my slap bass course called “Slap Bass Funky Fundamentals” over on CyberfretBass.com. It’s a full step-by-step system for playing slap bass.